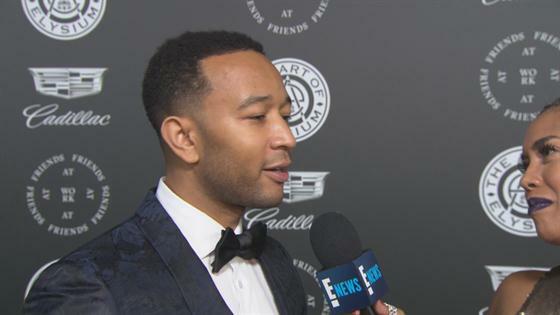 Is John Legend and Chrissy Teigen's Daughter Luna Ready to Be a Big Sister? Is John Legend's Daughter Luna Ready to Be a Big Sister? Chrissy Teigen and John Legend will welcome their second child together this year! Back in Nov., Chrissy revealed that she's pregnant with baby No. 2 in an adorable video posted on Instagram. In the video, Chrissy asked her and John's 1-year-old daughter Luna Simone Stephens what's in her belly. "Baby!" Luna replied. So is Luna ready to be a big sister in a couple of months? "She has no idea, she has no idea what's going on," John told E! News' Sibley Scoles exclusively on the red carpet at The Art of Elysium's 11th Annual Gala on Saturday evening in Santa Monica, Calif.
"We know there's a baby in there and she can say 'baby' but I don't really know if she knows what it means for her mother to be carrying another child and for that child to be her little sibling," John said. "I don't know if she's ready for that yet." The "All of Me" singer then shared, "She has no idea, she can't process it to that extent. I was an older brother, I had two younger siblings and I was excited when they came along. It was fun." So has the couple decided on a name for the baby? And check out Chrissy's second pregnancy style in the gallery!